1. What do you think of this model? 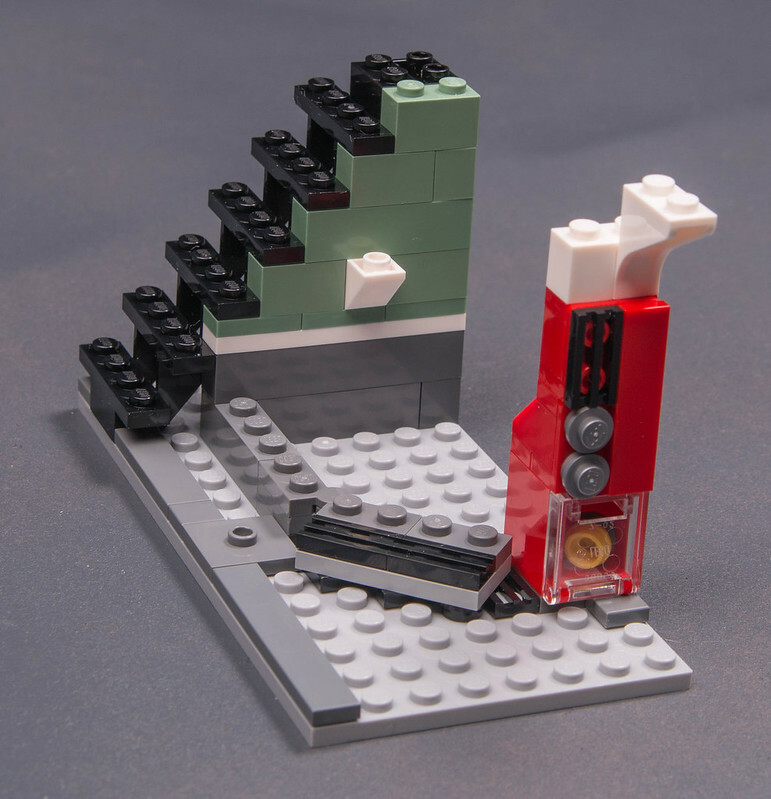 Thanks to EuroBricks for making this review possible! 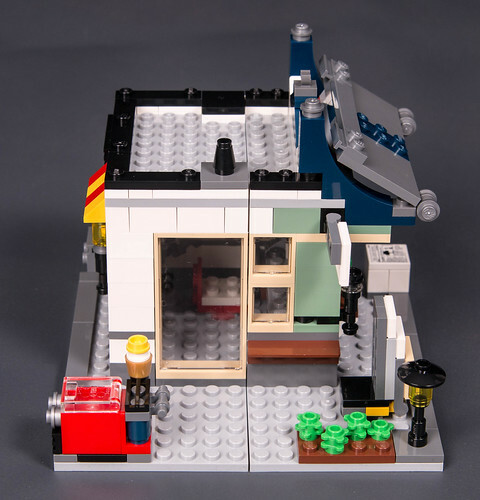 For years, Lego has offered a house of some sort in the Creator line each year - with the standard Creator 3-in-1 instructions, that's given us a very wide variety of housing. 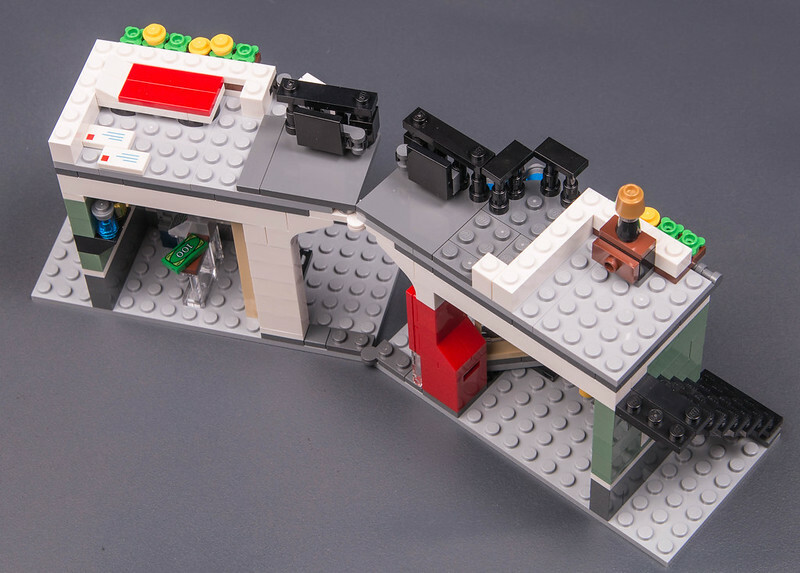 In 2014, they added a business option with their 31026 Bike Shop and Cafe set. This continues into this year's Toy and Grocery Shop set. 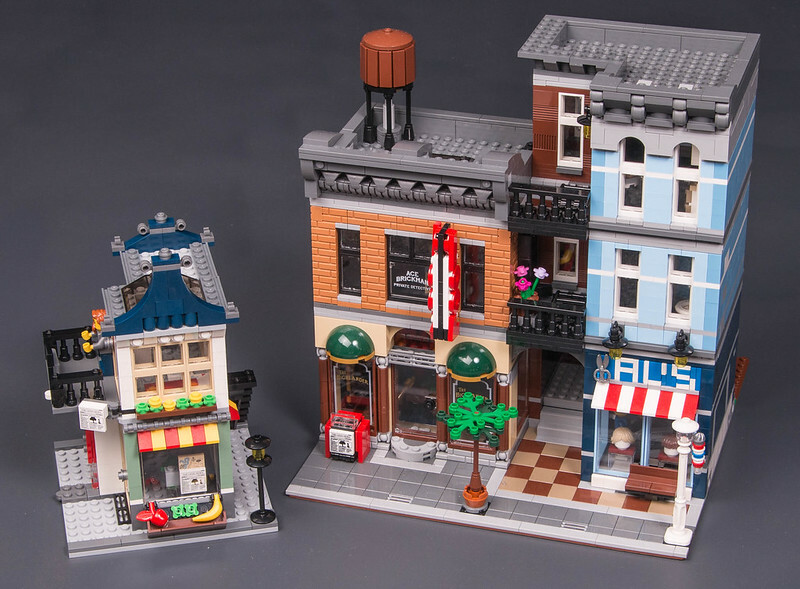 These shops are smaller than the very detailed modular buildings, but that should help them fit in better with the other City sets, and this also lets them get into more kids' cities with their lower pricetag. The front of the box shows the "A" version model out of the three, plus insets of the B and C versions. I like the sorta-European looking backdrop; it goes well with the styling of the buildings. Interestingly, the main model is shown opened up for play, while the two insets show those versions folded. 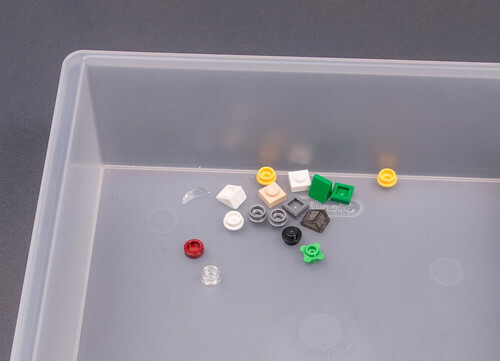 On the top of the box, Lego helpfully shows that with 3 of these sets, you can make a whole street. Yep, three actual, printed manuals. There's nothing indicating them as being A, B, and C models, but it's pretty obvious looking at the designs which is the "main" model and which are the alternates. Nothing new here, but two nice figs none-the-less. 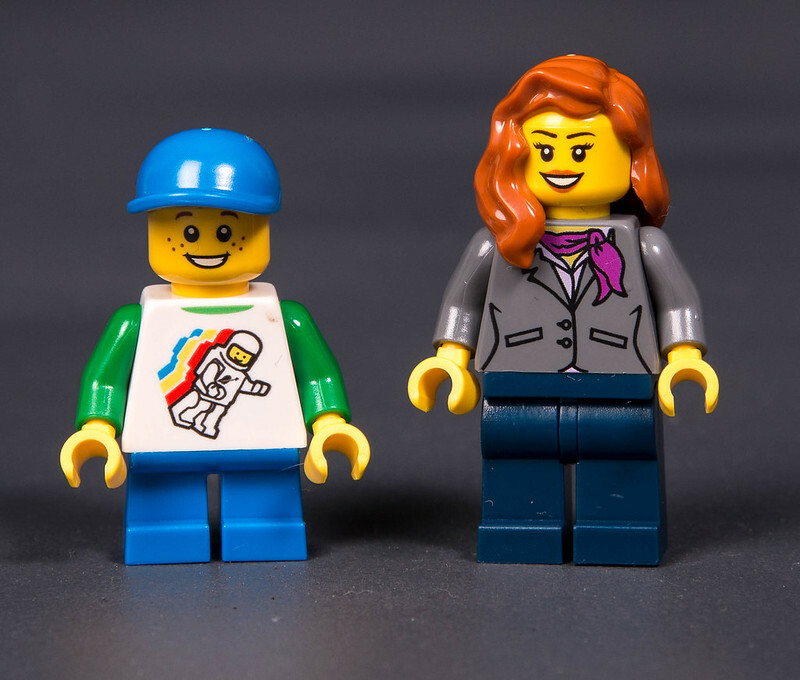 Well, Bricklink does say that both figs are unique to this set, but there's not any new parts to them. The closest thing to rare is the female head - it's only in this set, 2013's Dragon Mountain Castle set, a UK store grand opening set, and one of the 2014 Holiday freebie sets. The faces aren't that unique, but I guess this exact combo of two faces on the head is. I love the kid torso with the spaceman on it. No back printing on anything here except for an alternate female face. Sorry. I do like that her two faces are so different though. That's much better than when a head has a "scared" and a "more scared" face. Enough with the basics; let's build. I'm going to review them in the same order I built them, backwards. Since you can tell immediately looking at the 3 designs that they're going to use different numbers of pieces and so forth, I figured I'd build the smallest first lest it seem like a letdown. All three have some basic similarities - the two plates are hinged to give a building that opens for play. They also do have interiors, which you can see starting to form here. From the back side, the interiors are pretty plain. The shop half has a plant in a jar and a weird chair, and the newsstand just has a register. Here's the two sides of the folded building. On the hinge side, there's a bunch of windows in a disjointed wall with random colors. On the other, why did they put in a huge window when the set does include a trans-clear door that could have gone there? And you get a small patch of plants, like so many sets seem to have these days. A pretty similar start, with the hinge and little garden and some tiles along the ground. 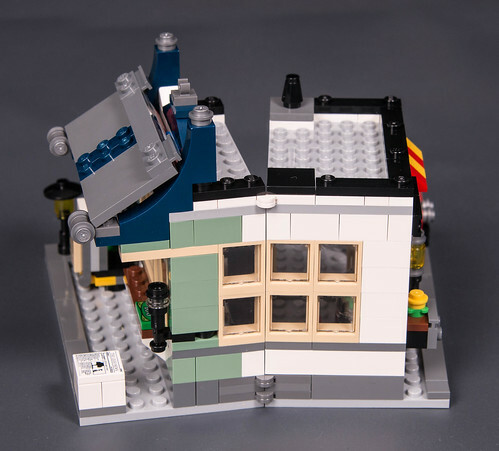 Now we see a big windowed wall, some details like lights, and how it has the usual alternate model "weird part usage" - like a 1x4 brick with side studs being used over the doorway, even though those side studs will not get used. The finished building gives us a nice little post office, with a letter-carrying bird on the roof. Hope that's not their normal method of delivery! Something about the colors just doesn't work for me though. The combo of white / light grey / dark grey / black / sand green plus tan is just too much. The tan window and door frames I don't like. On the inside, things are weird. The counter on the left is ok, but the light above the door (with a yellow clip? ugly!) is too big, and everything else over there by the door doesn't make much sense either. I like the front side here, except the colors are still too much. The bench, greenery, mailbox on the corner, and streetlight are all nice. The boy is a little creepy though - binoculars in hand PLUS a telescope on the roof of the post office? Why? The hinge side shows more of the weird colors you get in the wall, but that's going to be hidden when the set is open. 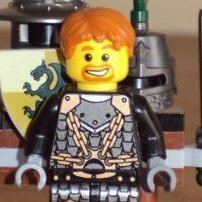 Plus we even see that on big modulars at times, so it's not SO terrible. The first half starts like this. Maybe it's just my bias, but it already feels like a more detailed build. Bottles on the wall, the yellow and red awning over the window, etc. The other half starts off with detailed work too. I think that's a red vending machine. The stairs are also VERY solidly built. I also appreciate the effort to get that diagonal base where a door will be - it's such a nice touch to have sections of a building that aren't right angles. Not too much has been added, but I wanted to showcase the tiny toys before they get hidden by a wall. That robot and train are just fantastic little micro builds. Things are coming together quickly. The walls, windows, and doors get the first floor nearly done. I'm still not big on the sand green and tan combo, but I do really like the red and yellow awnings. It appears the shop owner lives upstairs, since we've got a bedroom forming here. The bed is a little plain, but the table and lamp on the other half are great. And my big fingers did not like putting all those railings on the balcony, with the telescope posts and tile tops. Knocked quite a few off before I got them all done. And it's done. 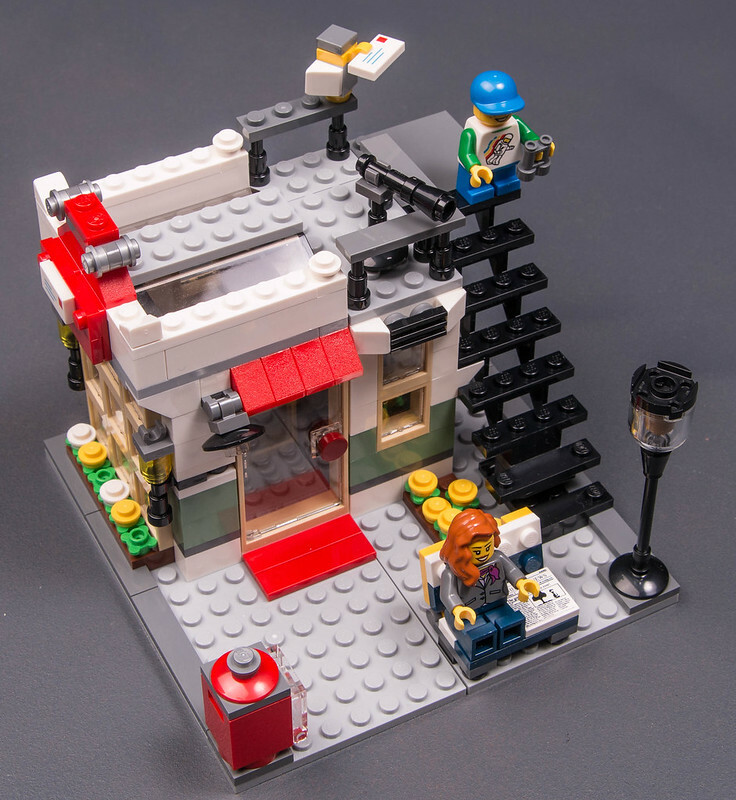 All the details make this set really feel like a mini-modular. 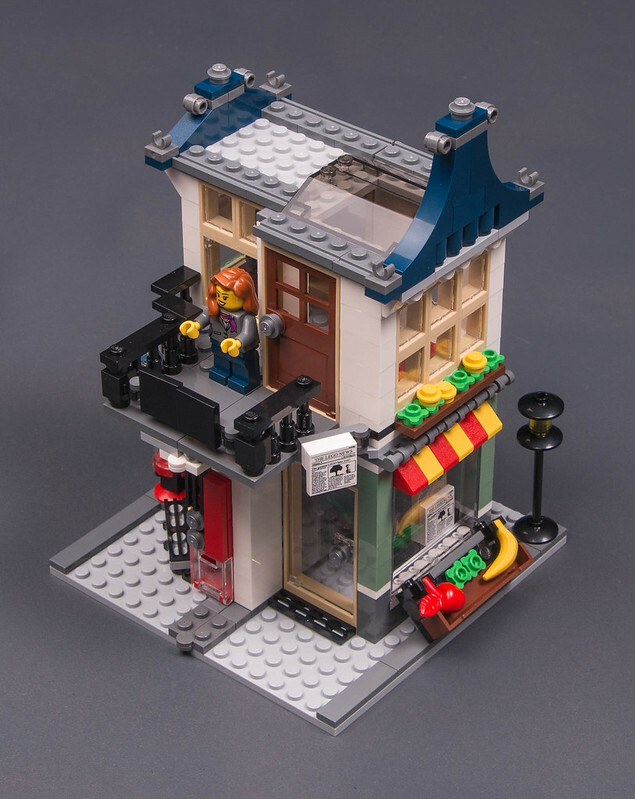 The roofline has great greebling, and the shop contents, and on and on. It's not perfect though. The tiny car above the toy store door isn't nearly as good as the toys inside. And the kid's yellow scooter? The wheels aren't even on the ground, much less able to roll. The scooter looks decent though, so that counts for something. Well, at least as long as you are at this angle, since the boy's only got 1 foot on the 1 stud wide scooter. Most of the interior has been seen already. The roof though does a nice job of being interesting for a roof. A skylight, the edge rails, etc. And you can see there's not much "wrong color" in the walls. An interesting building when folded up. Very tall and skinny. You can tell it's not really meant to be displayed this way - it's meant to be open. The good - lots! I like the awning, the diagonal door, the flowerbox under the upper window, the folding gate on the balcony that lets it be used in open or closed mode, and the green / white / blue colors. The bad - well, the stairs end short of the upper door, I still don't really like the tan doorframes (I think black would have been better), and why don't the upper floors match up in size? Ah, that's more like it. Just a few small pieces left as spares. You might have to click through to the full-size versions, but I did catch a few weird errors in the manuals. First, in the photo of the newsstand, the map in the front corner is on there sideways. The map does have a clear north arrow printed on it. On the second image, the boy's feet are hanging off the edge. Just unusual to see an alignment error in the manual like that. 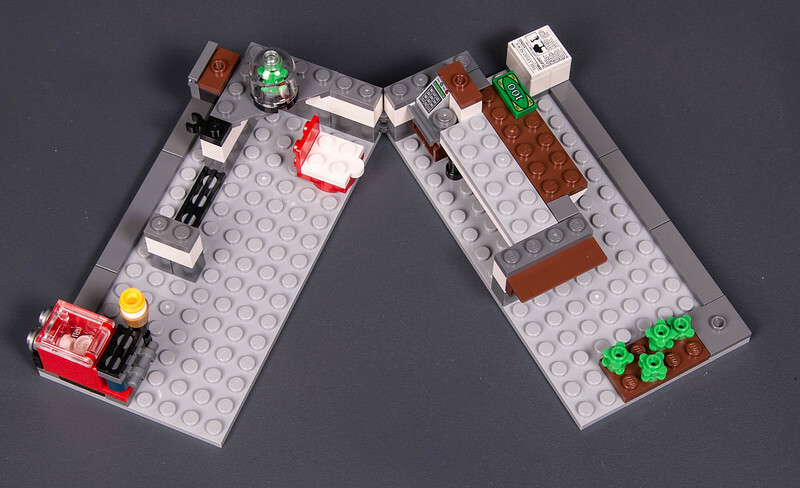 Here are this set and the modular Detective Office side by side. There's a huge difference - as you'd expect. But is the difference MORE than you'd expect? 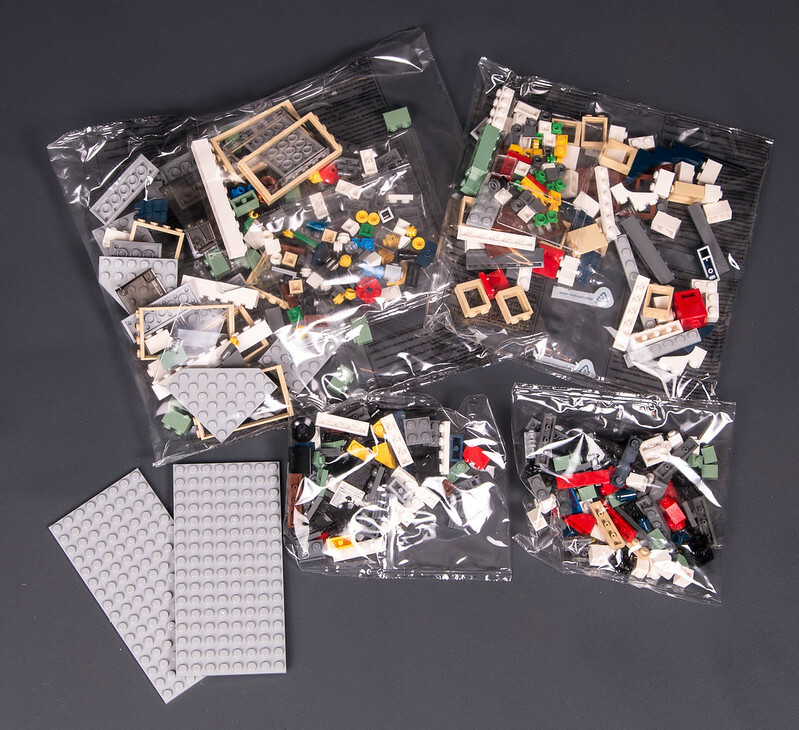 This set is 466 parts, $40. The DO is 2262 pieces and $160. 5 times the parts, 4 times the price. Looking at them side by side, I'd expect a bigger difference in both. So, what's my conclusion on this model? I love the main model, but the alternates are meh. 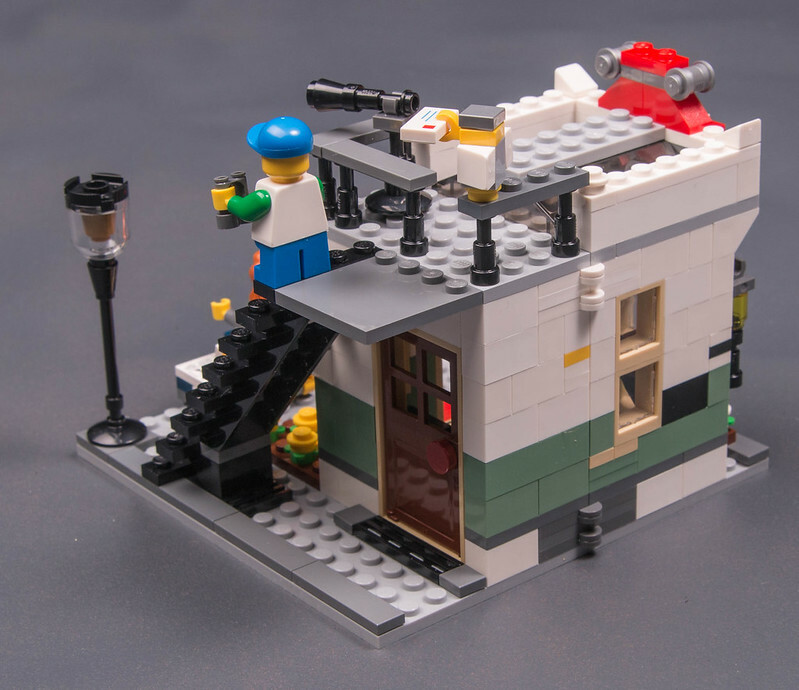 It's a nice set for someone looking for a town building other than police and fire stations, but who isn't ready to move to the modular line. Compared to the modulars though, it seems overpriced. Part of that is because the huge modulars are actually a great deal compared to other Lego sets. I'm also a little surprised that it's so small, when you compare it to the City sets like a police station. Those are generally designed with much more open space, letting them be more of a playset. This one is small and cramped, so it'd be tougher to play in. It's not really a City set though. Value: 7/10 - It's under the 10 cents a part mark, but that's largely due to having a TON of tiny parts. All those flowers and decorative 1x1 round studs add up quickly! Design: 7/10 - Good and bad on the colors, and there's a big difference between the quality of the main vs alternate models. Having so many leftover pieces is one thing when the Creator set makes 3 very different models (ie a boat, plane, and truck). When it's 3 buildings, it seems wasteful to have so many parts leftover. 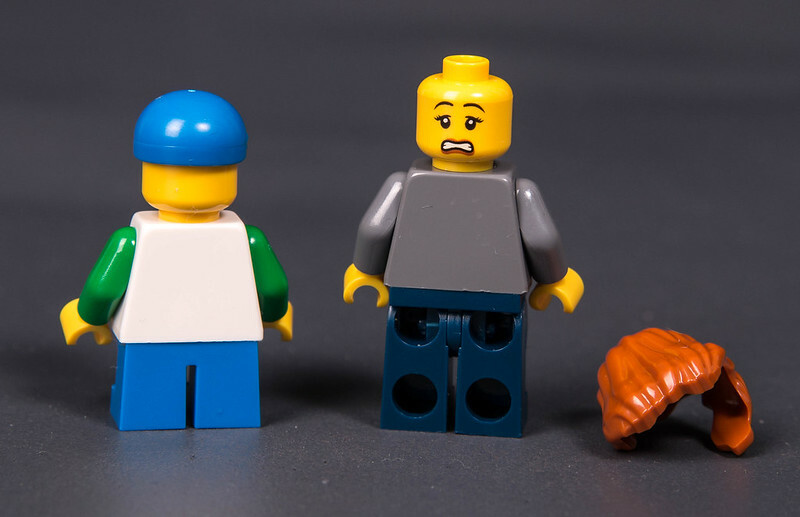 Minifigs: 6/10 - I'm not sure they both fit the set. I suppose the boy is going to the toy store and the woman is going to the grocery? But there's no storekeeper in either. The woman doesn't look like a storekeeper to me, so that's why I assume she's another shopper. I love the boy, but the woman is just so-so - except that I do appreciate the head having two very different expressions. But again, that doesn't fit the set. I can't see her scared face being used. Playability: 6/10 - The shops are detailed with registers and so forth, but it's all so tiny it'd be hard to play with the figs in it. Parts: 9/10 - Tons of windows and doors, plus nice sand green bricks. But some things (the large blue curves used on the roof for example) are weirdly specialized and would be hard to use in another building design. Overall: 7/10 - I'd recommend doing what I did - build the alternates first, then the main since that's how you'll want to leave it. 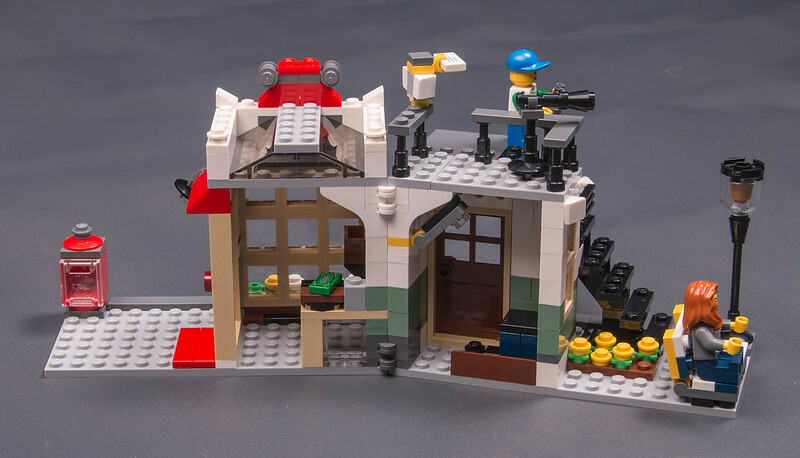 I'd really like to see the price a little lower compared to other sets (again, the part count is inflated due to SO MANY tiny parts) and the finished building is tiny, but it's loaded with neat details. Great review! Very thorough. It's not a set which makes me run to tye store, but it definitely has some fun elements. I do like your new grey background. Your pictures look great! 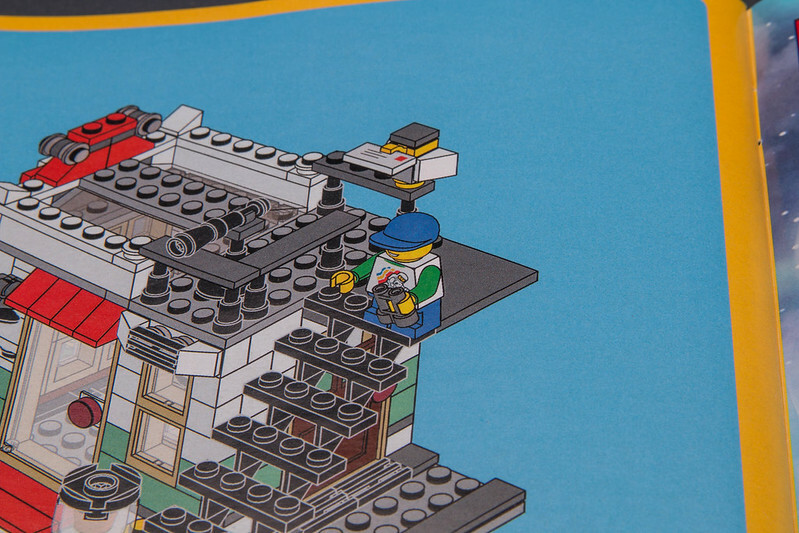 Any chance you have a picture of the News Stand next to the Detectives Office building as I would love to see the scaling for that? Nice review mostlytechnic. I particularly like the use of grey background surface for the pictures. It somehow makes the building stand out more. Good job! A terrific, very comprehensive review - but I'm not at all impressed with this set. It feels like a mishmash of bricks with no clear design aesthetic and as such blatantly underdeveloped (i.e. designed to hit a price/brick count point rather than provide a solid set in the Creator Town tradition). Compared to other Creator sets at this price point (31025 - Mountain Hut, for example) it feels utterly uninspired and ugly. Sorry, I do not - but it'd be tiny and not look like the same scale. Well, I felt like the main model ALMOST got to good looking :) I'd replace some of the tan with black, but otherwise I'm ok with that one. Cheers for putting in the time to create a wonderful review. I am not a huge fan of this set; I like the colour combinations, but it all seems a bit all-too-simple. It can (and will) be nicely modularised, though! Thanks 'mostlytechnic' for this review, I only brought this set to continue the shop series from creator. In my opinion it's only half as good as the bike shop/cafe one. Plus it doesn't fit the same as that pair of shops, oh well maybe next year Lego creator will have a better one. 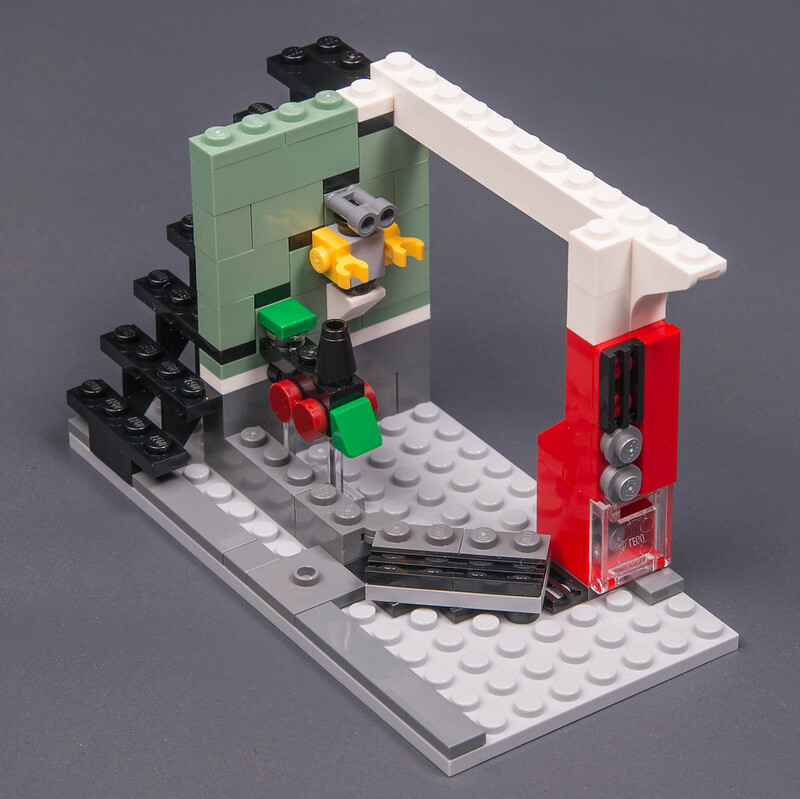 Brick On Review On 'mostlytechnic' ! 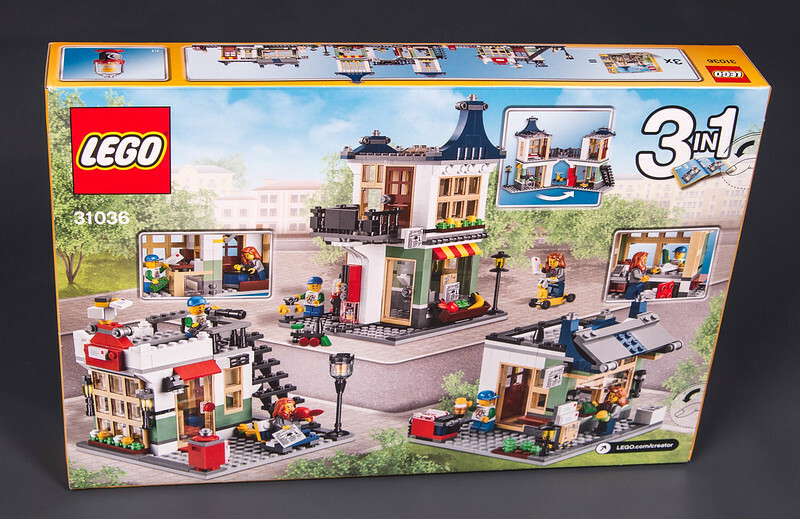 Reviews for this set really should picture them next to the Bike Shop & Cafe, which it's intended to be compatible with right down to the size of the baseplates and grey tiles around the edge. It doesn't look that great on its own, but if you add the two sets together you get something that begins to look like a street scene. 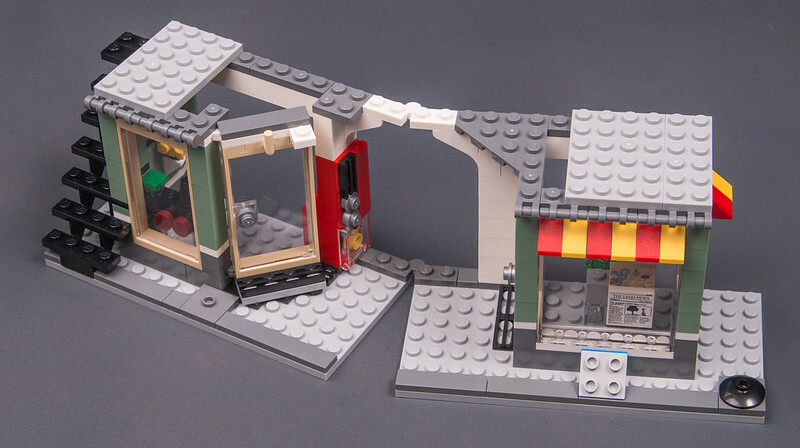 Well, it IS only half the price of the bike/cafe one too :) But I agree, it seems odd that they've made a couple "shop" creator sets that don't fit together in style like this. I guess they've done that for years with the creator houses though - none of those really work together. Interesting to get two comments right in a row with opposite opinions :) I don't have the bike/cafe set, but to me, they don't looks like they'd really go together. They're the same concept (two buildings that fold in half) but the sidewalk is different size and they just feel differently styled to me. This seems like half of a set compared to the previous Bike Shop/Cafe. 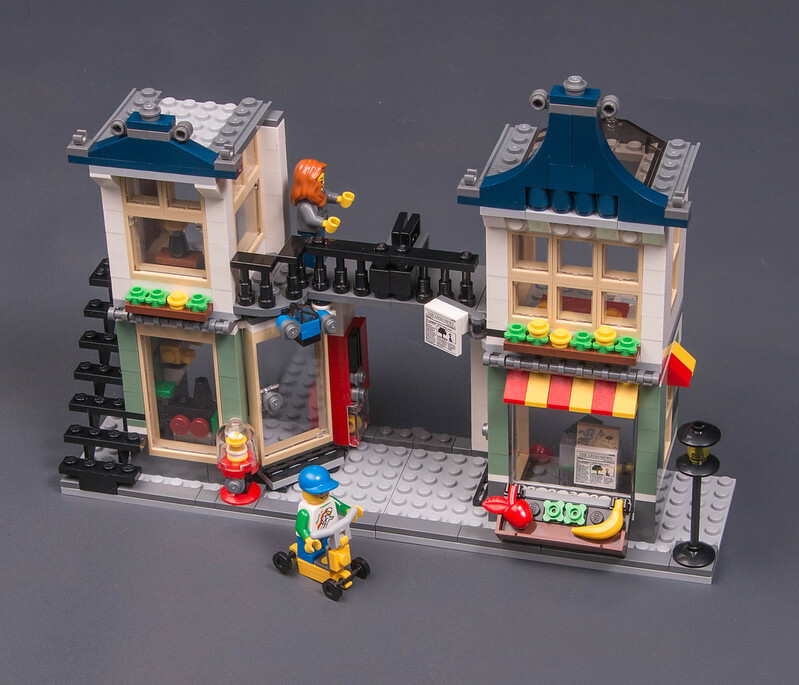 As I like many of the elements, I will probably buy a second one and build a mirror image version (making one entirely a toy shop and the other a book store/news stand) and adjust the sidewalks to work with the previous model. Then I think they will work well together. I remember a little area in Copenhagen that had this sort of architecture. I would hope the subsequent models are better deigned to create more complex alternatives, but these are both good starting points for original or enhanced models. 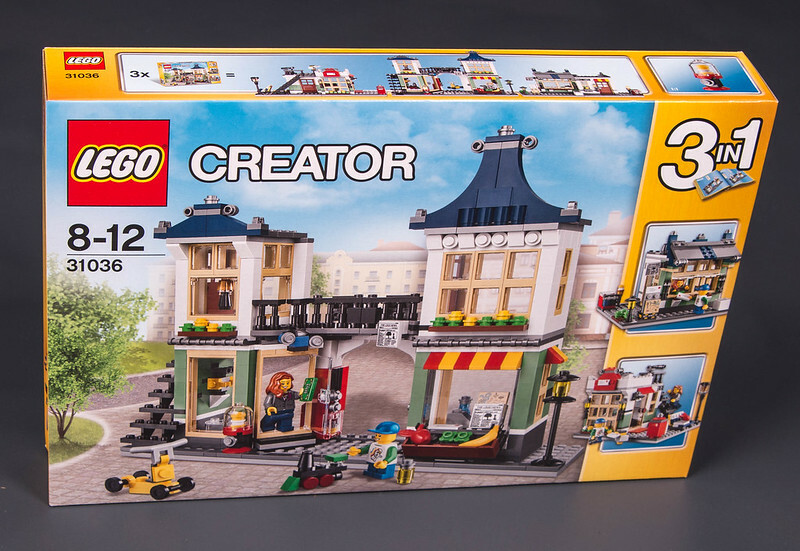 As a fan of Creator houses, I really want to like this set. However, I think that Creator houses have long filled a niche that's neglected elsewhere: residential houses. We haven't had a larger residential house since 2013; I'm not sure if these sets have anything to do with that, but it seems like they may be the replacement for larger houses. 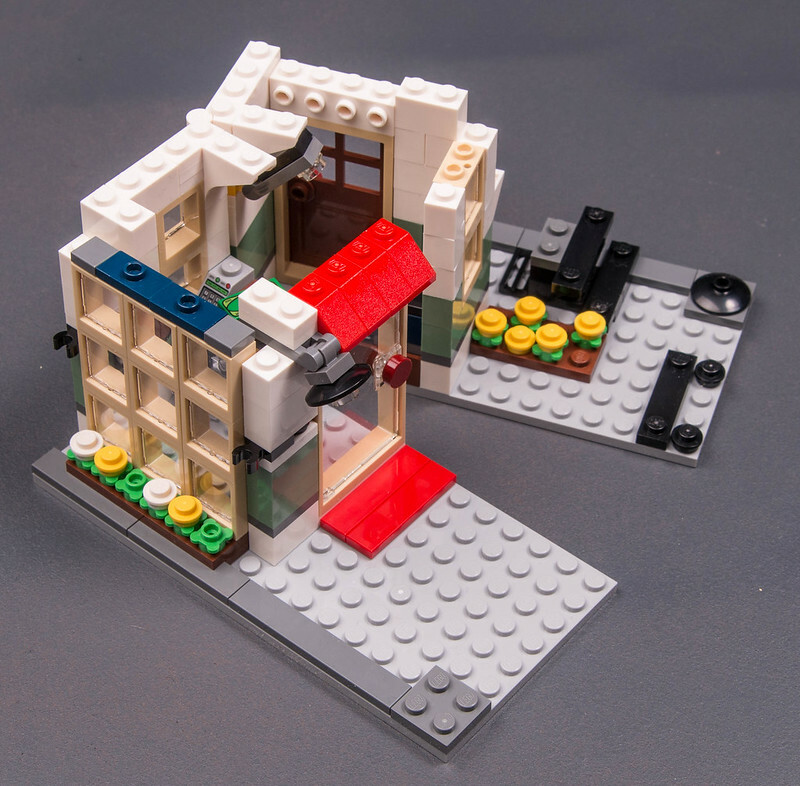 And I'd much rather have a larger house set than a set like this. I also agree with many others here; something about it just feels incomplete. I think that the various City business buildings we've gotten in recent years (including those in this year's City Square--which is much more expensive than this, but also contains much more) make for better buildings at this scale. I have bought it but I don't know what to say. The building is really poor, and the alternative models are ridiculous. It's not fair to compare it with a modular building, but I want to avoid to compare it with the bike shop and cafe because I paid €42 for it and I paid €37 for this one. And I think that I build both and I put them together I'm going to be very disappointed. 42 for the bikeshop? thats a bargain, a paid almost 60!!! Anyway - I am very happy with the bikeshop/cafe, bought it for the pieces actually. Thanks for the nice & detailed review! I have to agree with those criticizing this set - it just feels unfinished, and it wants to be too much at the same time. Either throw in another 500 bricks and come up with something similar to Bike Shop & Cafe, or just build one smaller structure with the pieces in here. The building/interior sizes are ridiculous in the main model. They're supposed to be buildings, but have next to no interior space. 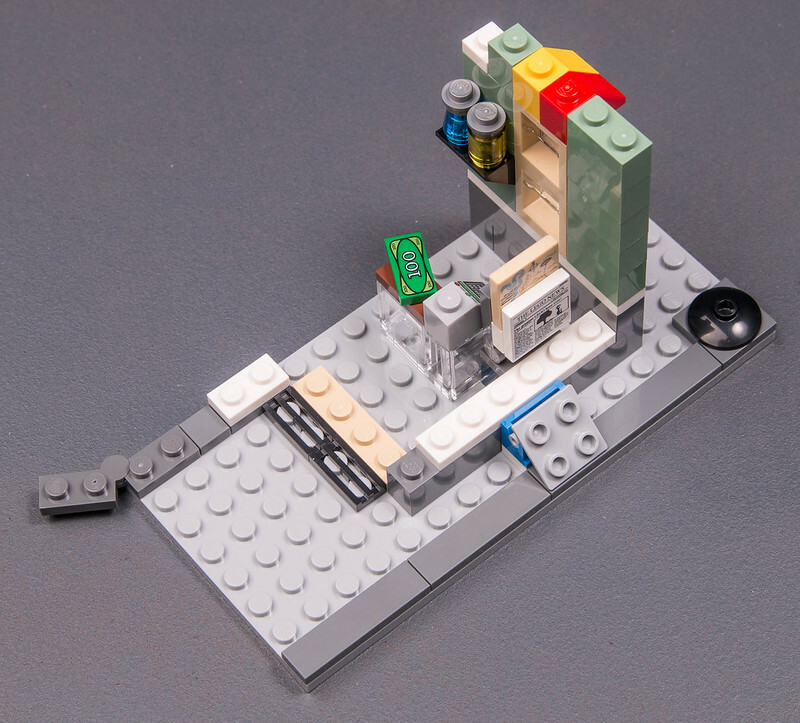 From this review, I have to say that the C build works best for me when viewed just as a small kiosk. 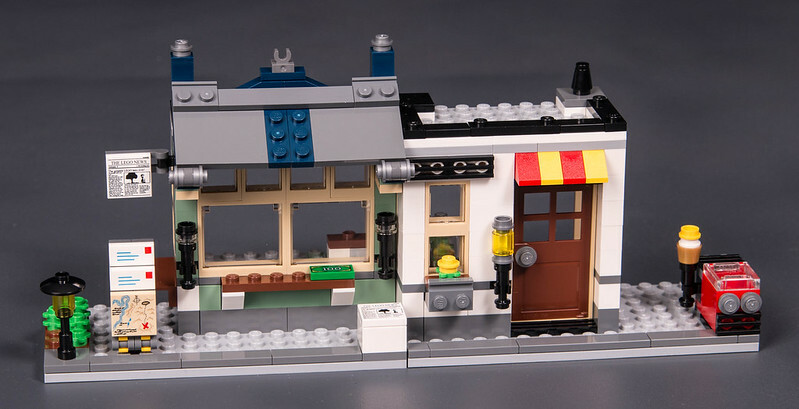 I really would've liked another set in the vein of Bike Shop & Cafe (bought two of those as a base for a future modular moc), especially with the sand green color, but this just doesn't seem worth it. I quite like the mini post office and am planning on getting the other 2 to make a little square type place with a fountain in the middle to go alongside my modular buildings. Thanks a lot for the review, mostlytechnic! Nice to see the B and C builds up close. This set has a lot of nice parts and even some nice desgin... but looking at the A build I can't shake the feeling that's something missing or wrong. On top it's not even easy to play with. It's just one of the weaker members of the great family of Creator houses, thinking of the Family House and Seaside House. I am actually surprised by the negativity on this set. While the other builds aren't great, the main build is. Especially for the size class. 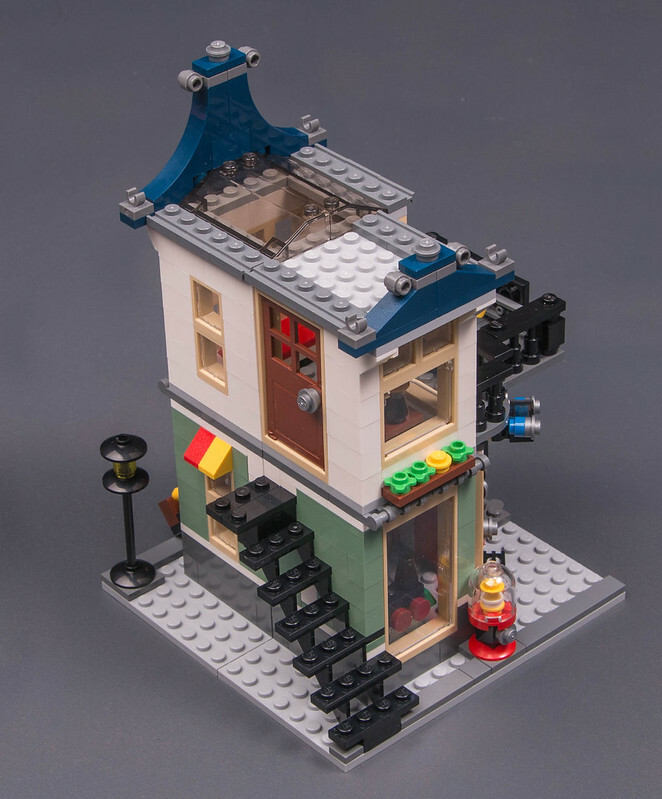 Sure, building modulars is better, but I look at this as a mini modular. I put this up there with the bike shop and cafe rather easily. In addition, they work together rather well as well. That is how my son is using it. Personally I am looking forward to more creator sets of this sort. But I would like more houses as well. Thanks for a thorough review. I'm not sold on the set though. While I like the business concept for City houses, it seems a bit to cramped to play with. What I do like about the set is the parts. In a way it feels more like a parts pack that a Creator set. Well, there aren't that many special and interesting parts. Another plus for the set as such is the 3in1 concept. I think that's great for the young ones. While I like the business concept for City houses, it seems a bit to cramped to play with. What I do like about the set is the parts. In a way it feels more like a parts pack that a Creator set. Well, there aren't that many special and interesting parts. Another plus for the set as such is the 3in1 concept. I think that's great for the young ones. However as a parts pack it's not bad at all, just because of tan doors/windows and sand green (never enough for those!)... 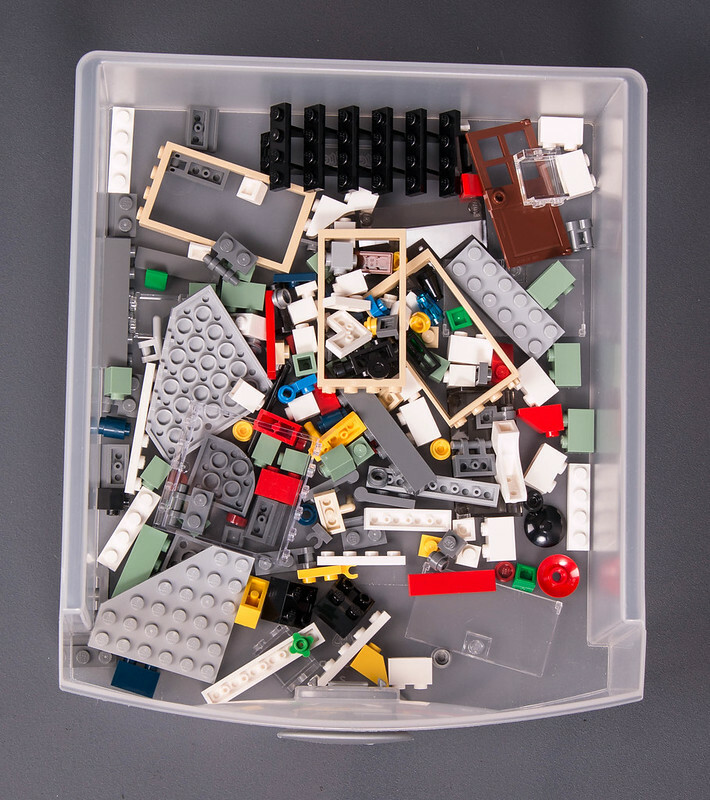 Actually I think the majority of the pieces in the set are good for using in a full-sized modular, or even for turning this set into a full modular. Overall, I'd buy it on sale and assimilate it immediately into my inventory... thanks for the review! Unfortunately the largest Creator home this year, the 31038, seems to have traded size for the 'Changing Seasons' gimmick. 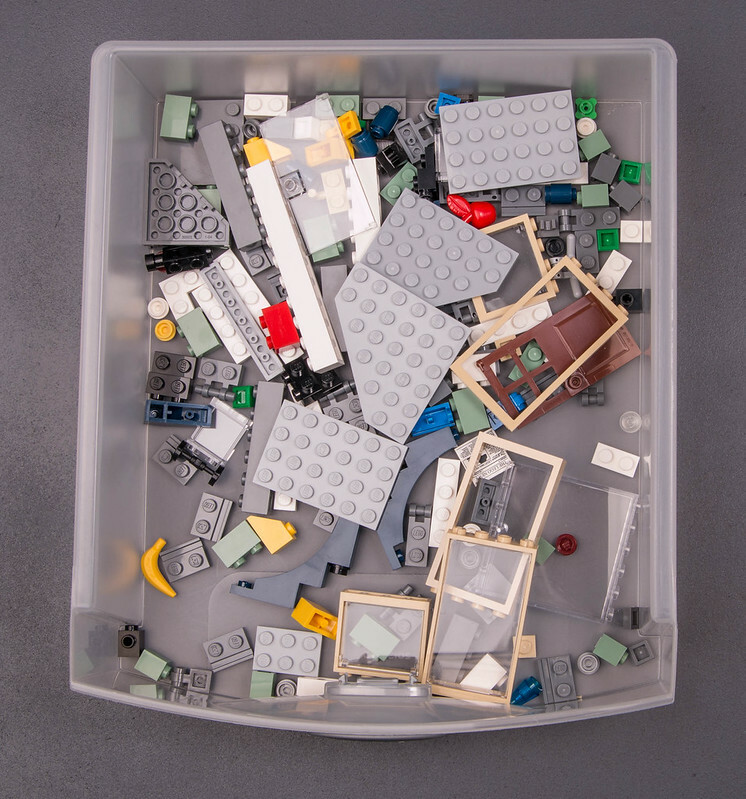 Actually, it has almost twice as much pieces as the 31036 Beach Hut, but that doesn't seem to have been translated into any kind of bulk. I suspect that because of the nature of the set, none of the builds use all of the pieces at once. 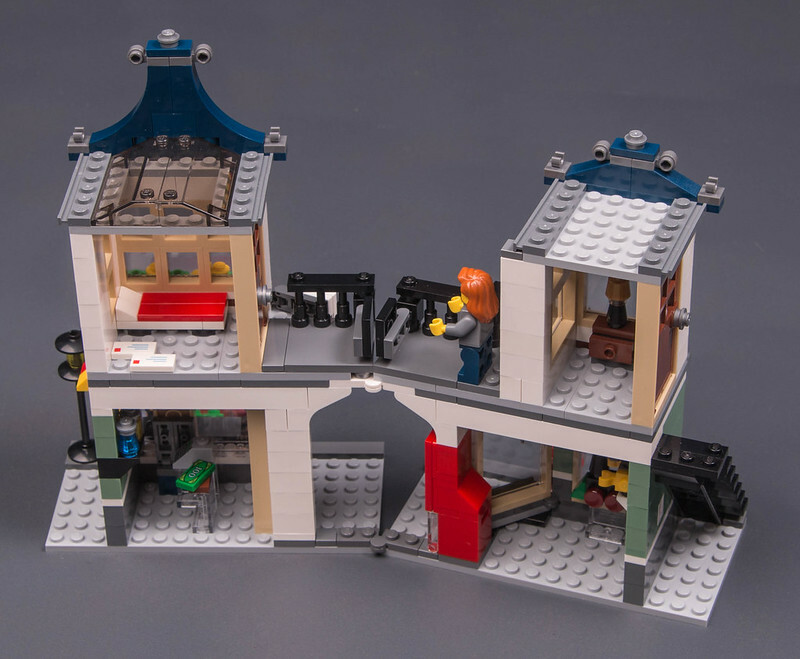 I'd love to see a revisitation of the 'Model' houses of years ago, but it would be very expensive to have a full-sized house AND fill it with the minifig furniture that all sets come with now. Just look at how expensive the Simpsons house was.